Sometimes love is all dressed up in its' Sunday best having an awesome time. And sometimes love is wriggling around together, barely breathing, in the deepest, soul-wrenching pain. Sometimes love is exciting and new, like they sang about on The Love Boat. Other times it is sitting side by side reading or the rhythm of the dryer balls clunking. Love can be massages and tickles and it can be pulling things out with tweezers or holding the dog while someone else gets the goop out of his eye. Love brings you flowers. Love brings you dirty laundry. Love celebrates in big over the top ways. Love says it's okay to celebrate by just being still. Last weekend we celebrated 70 years of love between my grandparents. They were married in 1943, when they were 17 years old. I do not have to explain to you that they have seen it all together. They have opened their home and their hearts to anyone who crossed their path. They have welcomed many, many people to their table. They have always worked hard, and still do. They still keep a garden. They still can and freeze food. These 87 year old sprites just hosted a house full of people last week. He's been splitting wood and stacking it for winter. She's been cleaning and cooking and baking. They make the rest of us, especially me, look lazy in comparison. I am so lucky because I got to be their first and favorite grandchild. I got to hear him whistle and play the harmonica. I got to eat endless amounts of her cooking. I sat behind her on the top of the couch and combed her hair. I went on tractor rides with him. He used to bring a snack pack pudding cup, when they were still in cans, home in his lunch box for me. She would make me potato pancakes. Their love has always been safe, a refuge from any storm out in the rest of the world. The example they have set for all of us who are lucky enough to be theirs is beyond compare. I am so grateful to get to witness this legacy of love. I hope that you have some people just as wonderful in your life. I hope I grow up to be as wonderful an example to someone else. You already are so wonderful! I love that - "their love has always been safe." I get that. My grandparents were married 72 years until he passed away last year. Talk about love. I want to know ,more people like your grandparents. I want to be more like your grandparents. I think this might be on of my favorite blog posts of all time by anybody. I learn from you all the time. Thank you for that. You won my Wolf Brand Chili giveaway!! Send me your phone number, email address, and home address. Thanks! Kim, I contacted you with my information via your contact button on your blog and the subsequent email form. Thank you! Wow, how incredible to have a 70th anniversary!! Congratulations to your darling grandparents! No wonder you are such an incredible person, having such a heritage! Too bad our society is changing. I am glad I did not divorce my husband, even though we had many cultural differences. That way my children can have a heritage. Now 9 grandchildren later, him and I have finally settled down to agree to disagree and are amazed that our 3 children have the most terrific marriages. Go figure! God knows best! And yes: our 2 girls have a garden , can and freeze their foods and save tons of money by being stay home Moms homeschooling their children. Life is good! 70 years!! That is just such a wonderful thing to just hear about. It makes my heart so happy to read stories like this. 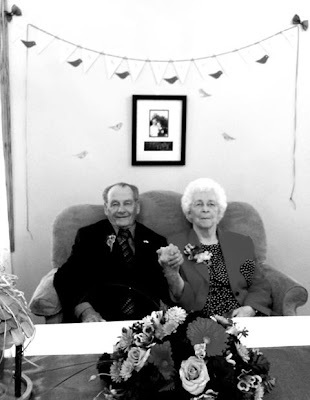 My grandparents had 50 wonderful years together before my grandfather passed away. I have been with my husband 30 short yers.